Our monthly dances commence at 7.30 p.m. until 10.30 p.m. in the Skeabost Memorial Hall with music provided on CD. The cost is £3.00 per person. Beginners' classes will be held on Tuesday evenings from 16 October at Skeabost Hall from 7.30 p.m. to 9.30 p.m. at a cost of £3.00 per person. All welcome - please contact the Secretary for further details. James Senior shoes will be available for sale. Click here for the May 2019 Application Form in PDF format. Click here for the May 2019 Friday Programme in PDF format. Click here for the May 2019 Friday Programme in MS Docx format. Click here for the May 2019 Saturday Programme in PDF format. Click here for the May 2019 Saturday Programme in MS Docx format. To print off the PDF documents you need to select "landscape" and print on both sides, flipping on short edge. 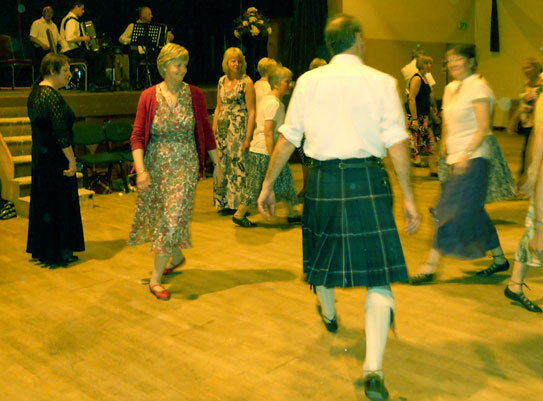 Over 90 dancers enjoyed the 2018 May Weekend at its new venue in Portree High School. Everyone enjoyed the music provided by Colin Dewar and his Scottish Dance Band which added to the great atmosphere in the Hall. The teacher on the Saturday morning was Les Lambert who provided dancers with some enjoyable, but challenging dances. Next year's May Weekend will be held on Friday, the 17th and Saturday, the 18th and will, again, take place in Portree High School. The music will be provided by David Oswald and his Scottish Dance Band. The teacher will be June Templeman from Pitlochry. Colin Dewar and his Scottish Dance Band have agreed to play at the 2020 May Weekend. Over a 100 dancers dancers attended the 2017 May Weekend and enjoyed the music provided by David Oswald and his Scottish Country Dance Band. The teacher at the Saturday morning class was Janet Johnstone who introduced the dancers to a range of dances to hone their dancing skills. Click here for the Saturday morning dances in Word Doc format. You can see some photos of this and previous years dances on our Gallery page. More than 90 dancers enjoyed the music of David Cunningham and his Scottish Dance Band over the weekend of 20th and 21st May, with William Williamson, this year's class teacher, providing a very entertaining and humourous session that was both informative and reinforced the basic dancing principles and etiquette.